Chandigarh is a wonderfully planned city that is not only a Union Territory of India, but also the capital of the two states of Haryana and Punjab. Together with the dream of the former Prime Minister Jawaharlal Nehru and the execution of Le Corbusier, Chandigarh was made into the beautiful city that it is presently. It is one of the cleanest cities of India and the outspoken youth have a phenomenal fashion sense that can be seen on the streets of the city. With brilliant architecture, gardens, natural beauty and more, Chandigarh is certainly a place that cannot be missed. Read on to know about the 8 best things that you must do at Chandigarh. There are quite a few replicas of the famous Eiffel Tower of Paris in the world. One such replica is found in Kota, Rajasthan which is slightly more popular than the one that is installed in Chandigarh. Located in the Leisure Valley in Sector 10, this replica of the Eiffel Tower was created by a set of students from Chandigarh College of Architecture in the Chandigarh Carnival of 2013. Till date, the replica still remains the city's favourite spot for clicking pictures and selfies! If you happen to visit Chandigarh in the month of November, you must definitely not miss the Chandigarh Carnival that takes place every year. This 3-day boisterous festival held in November is filled with performances of different kinds from different sections of people. It is a festival of dance, music, food and fun that happens at Leisure Valley, and acts as a platform for young budding artists from all fields, such as art, craft, singing, dancing, etc. Some of the interesting highlights of last year's carnival included a performance by a police band, a vintage car display, live performances, etc. Hop On/Hop Off (HOHO) bus service in Delhi is a tourist service that takes tourists around the state, through the galleries, monuments and other such tourist places in the state. A similar bus service has been made available in Chandigarh by the Chandigarh Tourism. An attractive, red-coloured, double-decker bus takes tourists around the city. The service is available on all days of the week between 8 am to 7 pm. It takes tourists through places like Sukhna Lake, Rock Garden, Sector 10, etc. The beautiful city of Chandigarh is lined with many beautiful gardens and it will certainly take an entire day to completely appreciate them. Zakir Hussain Rose Garden, that is located in Sector 16, is a beautiful place named after the former Indian president Zakir Hussain. It has over 1600 species of picturesque roses found in over 50,000 rose bushes. Terraced Garden is a place with acres of orchards and a musical fountain and Botanical Garden is lined with many exotic evergreen plants. These are some of the gardens of Chandigarh that you must visit without fail. Le Corbusier, a Swiss-French architect, who is considered a pioneer in modern architecture, built the Open Hand Monument that is installed in the Capitol Complex of Chandigarh. The hand was built to symbolise peace, prosperity and unity of humankind. Of the many Open Hand sculptures, the one in Chandigarh is the largest with a height of 85 ft and it is structured to rotate when a breeze hits the Hand. The metal structure is certainly worth a visit. 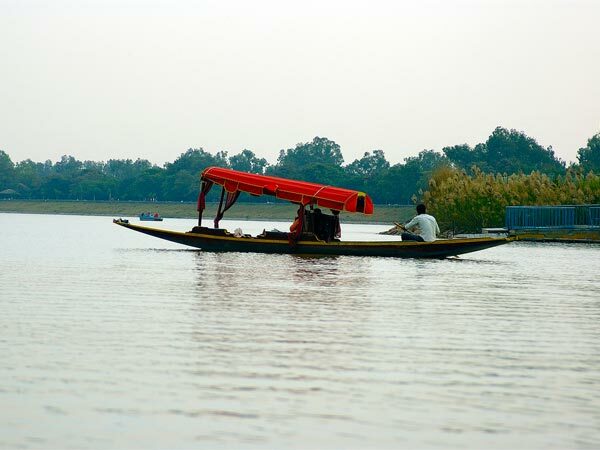 Sukhna Lake is a picturesque man-made lake that is settled at the base of the Shivaliks. It is spread across an area of 3 km. Since it is set against a backdrop of awe-inspiring nature and lush greenery, Sukhna Lake is the city's favourite getaway. Joggers and walkers usually crowd the lake early in the morning. However, you can spend an evening watching the sunset amidst the tranquil nature of the lake. Boating and water skiing are some of the activities that can be done on this beautiful lake. Chandigarh is a fashion hub where the people know exactly how to dress up. A huge array of shops are found on the streets of Sector 17, where you can find designer boutiques to small street shops selling the best of clothes and accessories that are in fashion. You can also stop by the many food joints and have delicious street food like Pav Bhaji, Aloo Tikki, Golgappa, all in Chandigarh-style! Nek Chand's Rock Garden is named after its creator Nek Chand, a government official who used to secretly create art out of rocks or industrial waste. It is a sculpture garden where you can find magnificent art made of recycled ceramic, glasses, electric wastes, you name it. At the time, his work was illegal and was in the danger of getting demolished. But after the support of the public, his garden lived and today it is spread across an area of 40 acres.